I'm starting to plan Seb's second birthday, and so I've been thinking a lot about his first birthday party. 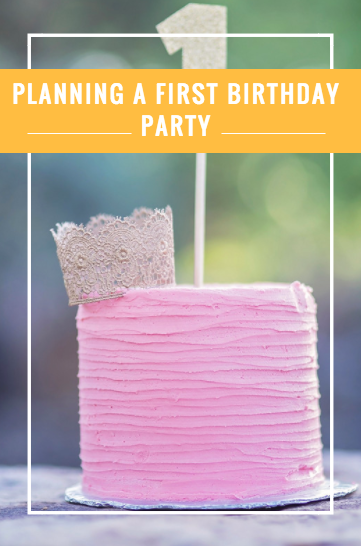 I know it may be silly to go overboard with a party for a baby because he won't remember, but really, it was a celebration for all of us that we made it through the first year. We had his birthday party at our house. It was the beginning of May, and I couldn't guarantee an outdoor party so I picked out his most fun toys and set them up all over our living room. 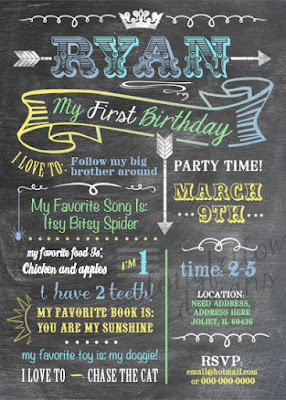 Invites - I ordered a custom chalkboard style invitation on Etsy and loved it. This one is similar. 1. 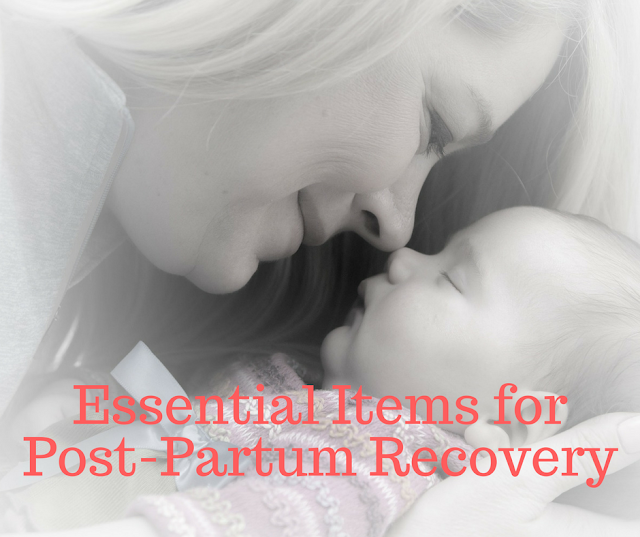 Stamp your baby's hand on a blank piece of paper with black ink. 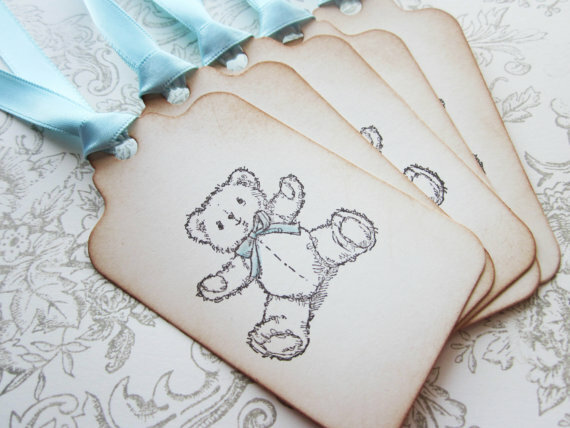 You can find baby safe ink that washes easily at craft stores. 2. Take a picture of the hand stamp and crop it to just around the hand. (My husband did some fancy programming work to make one of the fingers green for '1', but that's really not necessary). 3. Using a label template in Microsoft Word (I used Avery 5160), insert the picture of the hand in one corner, add the text you want or even another picture if you'd like. 4. Repeat for all of the labels you need. I don't know if anyone other than us and the grandparents even knew that was actually a pic of Seb's hand on the envelope seal, but I knew and felt that the personalized touch was special. We didn't have a theme for his birthday, so I just tried to make things colourful and party-esque. We put up balloons around the windows, and relied on the colourful food to decorate our living room. 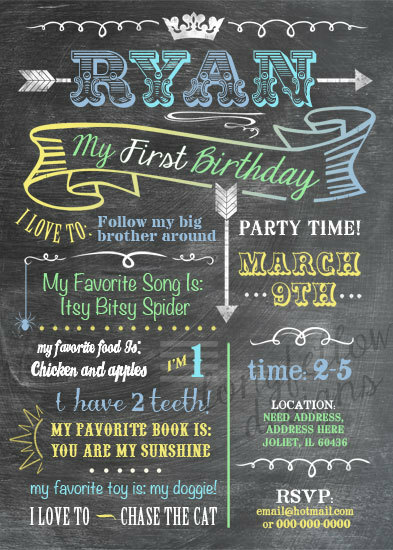 I loaded up our digital frame with pictures from S' first year, and I also ordered this amazing 'My Favourite Things' chalkboard poster from Moulage Collection that matched our invitations. The poster now hangs in our craft room where we have a new chalkboard wall so it works. I see that the Etsy store where I bought it now sells canvas versions which are equally cute and probably more durable. My friend makes the yummies cupcakes (if you're in the GTA and want her info, let me know), so I hired her to make the cupcakes for S' birthday. I had some big ones and some mini ones, and they were gobbled up. Other food I served included meatballs, a pasta salad, nachos and dip, applesauce, Veggiesticks, a veggie rainbow platter, and a fruit rainbow platter. I served water for the babies and wine/beer for the adults. 1. We asked guests to bring an item to the party to put into a time capsule for Sebastian that he will open on his 18th birthday. It was really fun to see what people brought, and I think it will be absolutely amazing to give him this gift when he turns 18. We have only just gotten around to packing it all up and made a video explaining each item and who gifted it to him. I instagrammed it here. I like giving just one item as a party favour, so the babies each got a pair of BabyLegs. I wrapped them in a muslin bag I had stamped with their name on it and added a little gift tag that said thank you from S. For the older kids, I got them each a comic from our local comic store. I'm thinking of giving everyone a little book and teddy bear bookmark this year. The ones I got are no longer available, but these Peter Rabbit ones from the same Etsy store are adorable. To catch all of the special moments, I found this to be a great list of all the pictures to try and take the day of the party. My favourite one is below (inspired by this pin) and was actually taken after everyone had gone home. But that's life; we celebrate with others, but it was the three of us that made it through that first year together.